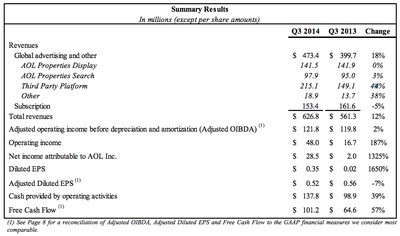 AOL’s revenue jumped 11.7% to $US626.8 million from $US561.3 million in the third quarter. That was ahead of analyst expectations of $US623.50 million. Sales were driven by strong ad sales. Net income attributable to AOL rose to $US28.5 million, or $US0.35 per share, for the third quarter ended Sept. 30, from $US2 million, or $US0.02 per share, a year earlier. AOL’s display ad business on its own properties was flat on a year over year basis. 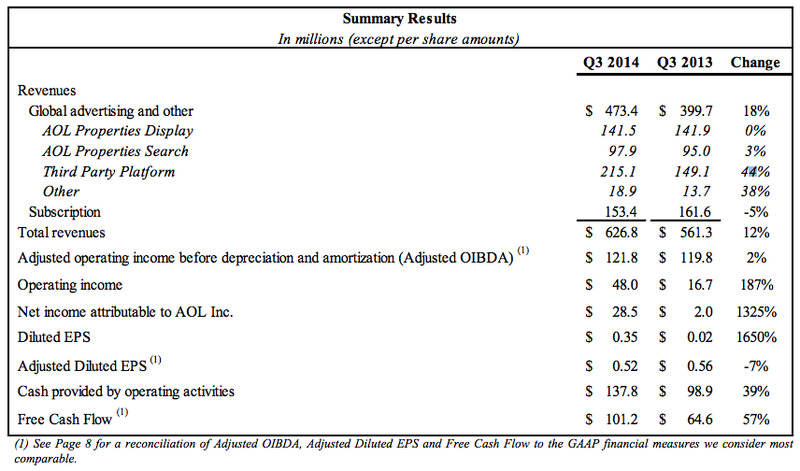 But, if you don’t include properties that were shut down or sold, then display ad revenue was up 7%. The ad business was really driven by its “third-party” ad sales.